Master’s Sun Director’s Edition DVD… YAY! Where did you get it?! I know that would be the perfect gift for my mom. Does it include English subtitles? You’ll get a postcard (in Korean LOL) that says you’ll get your item by 12/21. I don’t know if that will be the case or not, then it describes what ya got… 210 minutes of BTS, video of the press conference, director’s commentary, NG cut scenes, interview with the director, and about another hour of misc stuff. The BTS footage is about four times what we’ve seen posted online so I expect ALOT of good stuff! Thanks for the link! I think Google translation will help me a lot if I order it. Do you think any of the BTS stuff will be subbed? 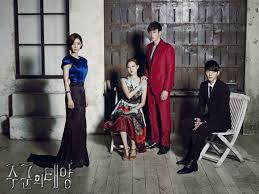 I mom really, really loves Master’s Sun, but I don’t know if it would be worth it without English subtitles. I’m hoping it’s subtitled LOL. I can get about 75% of Korean listening to it, but I miss the nuances. If she loved Master’s Sun like I did, she’ll love it anyway! But yeah, since they do international shipping, it’s probably subbed in 4 or 5 langues. Hi how was the director cut? Is it worth the money?